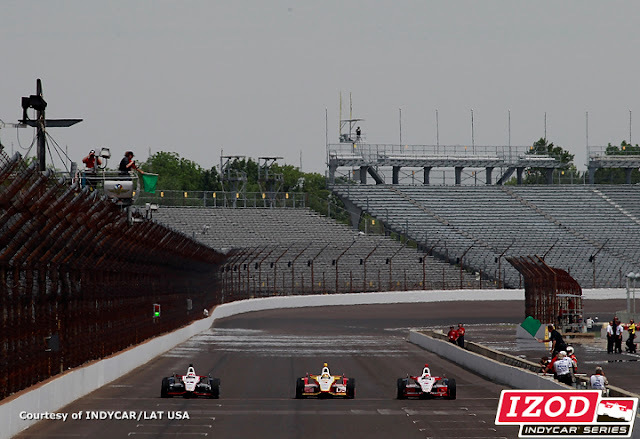 After four opening races for the 2012 IZOD INDYCAR Series, the illustrious 96th Indianapolis 500 will be the first oval event. The most sought-after single victory in open wheel and auto racing in general, making the traditional 33-car Indy 500 starting grid is the great race. While much news has surrounded the 2012 Rolex 24 of Daytona winning team Michael Shank Racing attempt to field the 33rd entry, examination of the entry list for the 2012 Indianapolis 500 appears to indicate there is already 34 cars entered even before Pole Day and Bump Day qualifying sessions (where a lot of deals with unattached drivers and share cars come together). While Newman/Haas Racing withdrew an entry shortly after Lotus announced they were repositioning their resources in the 2012 IZOD INDYCAR Series, Michael Shank Racing was not included in the initial list published by the Indianapolis Motor Speedway. With a deadline imposed by team owner Michael Shank passing and the contractual release of driver Jay Howard, there is little-to-no chance of seeing plans coming to fruition. Driver deals prior Townsend Bell has been announced as the driver of the #99 car for Schmidt-Hamilton Motorsports. With Bell's appointment to the entry list for the Indianapolis 500, the only ride yet to receive a driver is the second car Ed Carpenter Racing will be fielding for the event. Michel Jourdain Jr is also making a return to open wheel competition in a second entry for Rahal-Letterman-Lanigan Racing. The Andretti Autosport team will also support Conquest Racing and AFS Racing efforts for the Indy 500 "Month of May" festivities. Ana Beatriz, Bryan Clauson, Sebastian Saavedra and Jean Alesi are some of the other drivers not part of the 2012 IZOD INDYCAR Series regular roster entered in the 2012 Indianapolis 500. Drivers have not been the ingredient in short supply for IZOD INDYCAR Series entrant in the 500-mile race at the Indianapolis Motor Speedway. Due to turmoil with Lotus, teams and cars have been requiring engines. For Dragon Racing (a team initially spared from Lotus' engine circulation costs announced ahead of the Brazilian street race), team owner Jay Penske has pressed his organization into a multi-million dollar lawsuit alleging representative of the British sports car name has been making false claims about the race team. Speculation indicate Chevrolet could power the Dragon Racing cars at Indy. As for two teams that Lotus had dropped in efforts of better focusing their engine development, Bryan Herta Autosport picked up Honda power while Dreyer & Reinbold Racing has appeared to reform a relationship with Chevrolet. Dreyer & Reinbold Racing last ran Chevrolet engines during the 2004 IndyCar season. According to May 11th's entry list, only the HVM Racing car driven by Simona de Silvestro and the #64 Lotus – FP Journe – Fan Force United (based off an Indy Lights organization) fielding former Formula 1 winner and Lotus brand ambassador Jean Alesi are set to run Lotus engines. As for one IZOD INDYCAR Series regular, Dario Franchitti will not be sporting has traditional #10 he had worn to three-consecutive championships the past three seasons and the 2010 INDY 500 race win. To commemorate Target Department Stores' 50th anniversary, Franchitti's Target/Chip Ganassi Racing entry will be wearing the #50 for only this race.